Worship in Women’s Hands will screen on Sunday, January 11 at 5:30 at Patanjali’s Place in downtown Durham, NC. Carol Thomson and Lorna Collingridge will introduce the film and be available for discussion. After Worship Rhonda Klevansky will screen her work-in-progress, Welcome to My Paradise, followed by audience feedback with the filmmakers. A vegetarian potluck will follow around 6:45. Please label food for individuals with food sensitivities; bring utensils and plates to reduce environmental impact of waste disposal and a blanket for picnic-style seating. An Interactive CD-Rom integrating texts, music, and visual art – a new production from the authors of Worship in Women’s Hands! As an interactive CD-Rom, Ocean Psalms crisscrosses the use of ocean imagery in biblical allusions, ancient hymns, and mystical texts with the particulars of contemporary lives, where the sea is present in a number of quite different ways. These include the sea as a symbol of pleasure (as in meditative music and images of peaceful shores), of threat (witness the 2004 Tsunami and Hurricane Katrina), and of profound environmental concern (over rising sea-levels and intensifying storm activity, coastal erosion and habitat destruction, industrial and municipal waste pollution, over-fishing, etc.). Taking contemporary realities into account, Ocean Psalms at heart seeks to foster contemplative engagement with the ocean as a site of encounter with Ultimate Reality, in the hope of awakening both reverence and compassion for our threatened oceanic ecosystem. For more information, samples and ordering, go to www.oceanpsalms.com. Worship in Womens Hands was screened, in excerpts, at the 21st Congress of the Societas Liturgica in Palermo, Sicily on August 7. Over 200 liturgical scholars from around the world and from a great many different churches had gathered in Palermo, Italy, for a Congress on the theme “Liturgy and the Public Square.” Within a paper on gender as a fundamental marker of all cultural formations, i.e. also sacred and public space, Teresa Berger presented “Liturgies in Women’s Hands” as one contemporary way of reconfiguring the gendered constraints for women which have marked sacred space in the past. A spirited discussion followed the presentation. On February 27, a group of Duke Divinity School students, faculty, and staff gathered for one of the regular Women’s Center meetings to screen and discuss the documentary. A lively discussion with the two co-producers who were present followed. Worship in Women’s Hands was launched at the annual meeting of the North American Academy of Liturgy in Toronto, Canada, January 4-7, 2007. The video documentary premiered on Friday, January 5, during a session of the Feminist Studies in Liturgy Seminar of the North American Academy of Liturgy, an ecumenical and inter-religious association of liturgical scholars. A lively discussion followed the video presentation. One professor of worship remarked during the conference that she had waited for something like this video for years. The video “Worship in Women’s Hands” — the first sustained documentary ever of liturgies celebrated by women, for women, and in the company of women — documents three liturgies celebrated between 2004 and 2006 and, through interviews with participants, analyzes the profound meaning these worship services have for faith communities now and into the future. Even if individual liturgies like these have taken place around the globe for many years now, their documentation has remained mostly on the level of printed materials and of amateur filming. Such filming also typically captured only one liturgy or another, never a series of such liturgies. 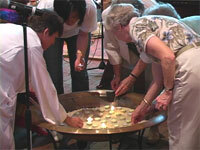 The liturgies in the present video, moreover, claim a distinct place within the larger realm of women’s rituals and feminist liturgies: These worship services were celebrated not on the fringes of established faith communities or in private homes but in a local parish and within its sanctuary. The liturgies were openly advertised in the parish bulletin and attended by many women (and some men) from surrounding parishes and beyond. As such, these liturgies open up a much larger public space than typical women’s liturgies do. This documentary’s subject matter (at its broadest: gender and faith) is a potent and much-discussed issue in contemporary culture and faith communities; its audience thus is extensive. Most directly, this documentary video will appeal to a wide range of people living and working with issues of women and faith, be it those “in the pews” of local faith communities, those in ministerial leadership (e.g., religious educators and chaplains), or those with responsibility for women’s groups within parishes, retreat centers, etc. The video will also be of interest to educators (e.g. in high schools, Divinity Schools and Religious Studies, Women’s Studies and Gender Studies Departments) and to anyone interested in the lived lives of faith communities “on the ground”. Finally, scholars studying contemporary religious communities and their struggles with issues of gender as well as scholars interested in women’s ritualizing will find in this video fascinating material for analysis.